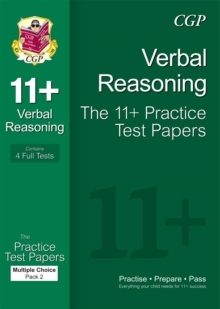 This is Pack 2 of CGP's Multiple Choice 11+ Verbal Reasoning Practice Tests. It contains four realistic practice papers with separate multiple-choice answer sheets - ideal preparation for the 11+ tests set by GL Assessment and other test providers, and excellent practice for the Kent Test. A detailed answer book is also included, with full explanations of every answer and useful notes for parents. For even more practice, Pack 1 is available, containing four different practice tests - see 9781847628237.